Running, to me, is exhilarating. The way that you have to get all parts of your body working as one, together. But running is really hard when you are unfit. Trust me, I'm feeling it. Too many years ago to count, I used to be a better than average runner. I ran all through high school and university and then on and off again throughout my working life. Back then, I wouldn't say that it was easy.....but the challenge was more around pushing myself to better my time or to run further. Right now the challenge is just to run - for any amount of time. I hear a lot of people tell me that they can't run at all. But I would challenge that way of thinking. Running is doable, but you have to take it slowly. Very slowly. Go too fast and your body will be aching and sore and you won't want to get back into it. A colleague at work in his 50's decided that he wanted to get fit. He had never run in his life but that day he put on his running clothes, laced up his shoes and jogged to the mailbox and back. Then he went inside, put away his clothes and patted himself on the back for taking, literally, the first steps. Every day he would put on his clothes, lace up his shoes and go a little further. Day two was to the first light pole and back; day three was the second light pole and so on. By the time I met him, he had been running for years and was a marathon runner. And a good one at that. Running was his thing. My Dad did a similar thing. He has been pretty fit his whole life - very competitive with himself and others and when he sets himself a goal, well he does everything in his power to achieve it. He plays squash competitively and wanted to raise his level of cardio fitness so that he would 'run all day' on the court. So he took up running. He dedicated himself to running - starting off slowly - and eventually was able to run 10 km non-stop! I'm pretty proud of that. Plus, he also got my Mum into running as well - something I'm sure she never thought that she would do. So, running is contagious! It's amazing. Even if you don't think you can do it, just give it a try. If you haven't exercised in a long time, then just go for a brisk walk for the first week or two. Then, in week three, try jogging for just 30 seconds. Then rest (while walking) for a minute or two and then do another 30 seconds or a minute (if you can). Once you've been doing that for a while (how long depends on your own body and level of fitness), try out my beginner workout. Although I work out on a treadmill (it's easier to find the time to run on a treadmill for me), you could easily adapt this to an outdoors run. This is what I've been doing over the past week or so. It's not always 20 minutes, it's been 18 minutes and 22 minutes. But this is just a guide. Have a go at it and change it if you need to so that it suits YOU. 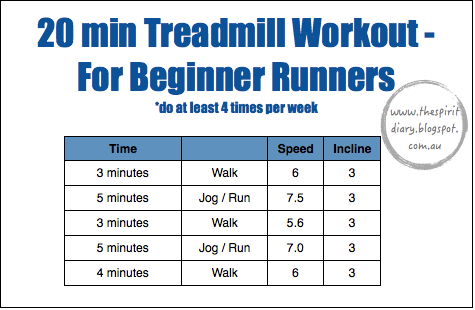 To use it, print it out and put it on the treadmill so that you can refer to it, if you need to.